I do love to combine challenges. As you probably know. So when Susan set the current One Layer Wednesday challenge, Bugaloos: any type of bugs you want to use, I knew exactly which image I was going to use. So I stamped the image and the sentiment last week and left it uncoloured and unfinished in the hope that another challenge would come along that I could combine with this one. I added some Stickles on the bees' wings, the candle flame and the, er, bits on the cupcake (you can tell I don't bake cupcakes) then added some baker's twine at the top of the card to balance the design. Love your bee-autiful shading! Thanks so much for playing along with us at CASology this week! Really love your stamped image, so perfect for "yellow"
Absolutely adorable card, Shirley! I love your coloring, too! Total cuteness!!! :) Love the triangular shape of your overall design and bees definitely represent the color yellow! Shirley what an excellent design. Love your birthday cupcake. Thank you for sharing with usu this week at CASology! ...and another amazing image. 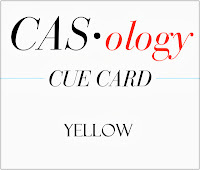 Staying with yellow was totally the way to go with this card! Bright, fun, whimsical and sweet as the little yellow cupcake! Oh, my, total CUTENESS! What an adorable image and a sweet, sweet birthday card! Thanks for joining in the fun at CASology! Awwww...this is adorable! Love it! So glad you joined in on the fun at CASology this week! Sorry for the double comment Shirley! Although, this card is good enough for a second "amazing!" I just wanted to stop back here to say Congrats on your HM at CASology! LOVE this charming card!!! Popping back to congratulate you, Shirley Girley, on the HM Honor from CASology! !